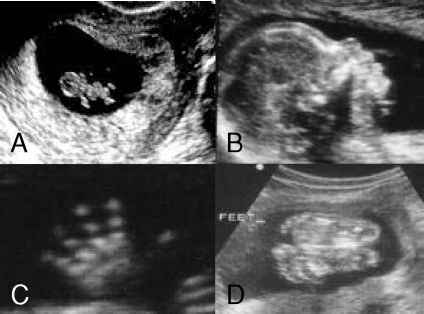 Figure 7.3 Examples of the effectiveness of ultrasound in imaging the embryo and fetus. A. 6-week embryo. B. Lateral view of the fetal face. C. Hand. D. Feet. movement of heart valves, and flow of fluid in the trachea and bronchi is possible. The technique is safe and commonly used, with approximately 80% of pregnant women in the United States receiving at least one scan. Important parameters revealed by ultrasound include: characteristics of fetal age and growth; presence or absence of congenital anomalies; status of the uterine environment, including the amount of amniotic fluid (Fig. 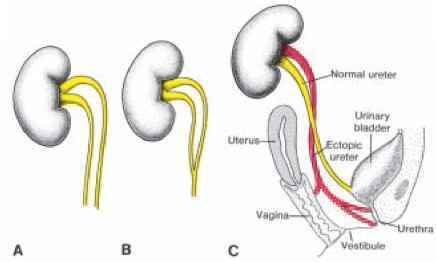 7.4A); placental position and umbilical blood flow; and whether multiple gestations are present (Fig.7.45). All of these factors are then used to determine proper approaches for management of the pregnancy. Determination of the fetal age and growth is crucial in planning pregnancy management, especially for low-birth-weight infants. In fact, studies show that ultrasound screened and managed pregnancies with low-birth-weight babies reduced the mortality rate by 60% compared with an unscreened group. Fetal age and growth are assessed by crown-rump length during the fifth to tenth weeks of gestation. After that, a combination of measurements, including the biparietal diameter (BPD) of the skull, femur length, and abdominal circumference are used (Fig. 7.5). Multiple measures of these parameters over time improve the ability to determine the extent of fetal growth. Figure 7.4 A. Ultrasound image showing position of the fetal skull and placement of the needle into the amniotic cavity (arrow) during amniocentesis. B. Twins. Ultrasound showing the presence of two gestational sacs (S). 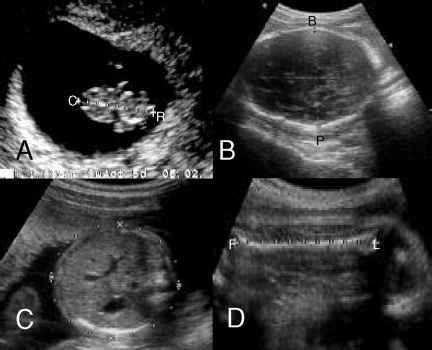 Figure 7.5 Ultrasounds showing measures used to assess embryonic and fetal growth. A. Crown-rump (C-R) length in a 7-week embryo. B. Biparietal (B-P) diameter of the skull. C. Abdominal circumference. D. Femur length (F-L). abdominal wall defects, such as omphalocele and gastroschisis (see Chapter 13); and heart, (see Chapter 11) and facial defects, including cleft lip and palate (see Chapter 15).